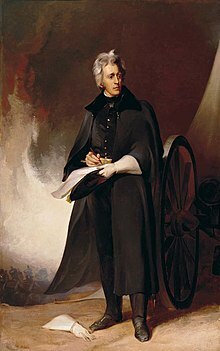 Andrew Jackson (March 15, 1767 – June 8, 1845) was an American soldier and statesman who served as the seventh president of the United States from 1829 to 1837. 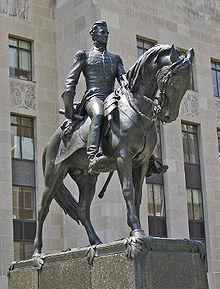 Before being elected to the presidency, Jackson gained fame as a general in the United States Army and served in both houses of Congress. 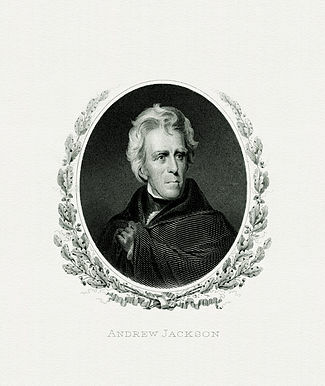 As president, Jackson sought to advance the rights of the "common man"  against a "corrupt aristocracy"  and to preserve the Union. 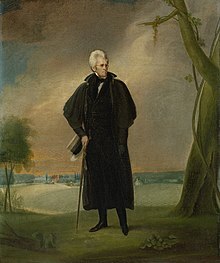 Born in the colonial Carolinas to a Scotch-Irish family in the decade before the American Revolutionary War, Jackson became a frontier lawyer and married Rachel Donelson Robards. He served briefly in the United States House of Representatives and the United States Senate, representing Tennessee. 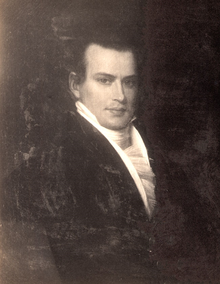 After resigning, he served as a justice on the Tennessee Supreme Court from 1798 until 1804. Jackson purchased a property later known as The Hermitage, and became a wealthy, slaveowning planter. 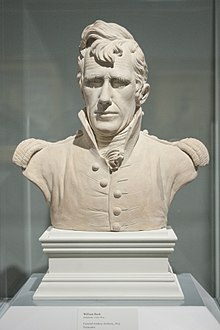 In 1801, he was appointed colonel of the Tennessee militia and was elected its commander the following year. He led troops during the Creek War of 1813–1814, winning the Battle of Horseshoe Bend. 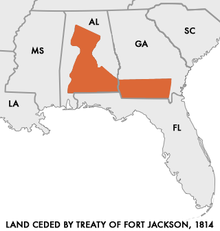 The subsequent Treaty of Fort Jackson required the Creek surrender of vast lands in present-day Alabama and Georgia. 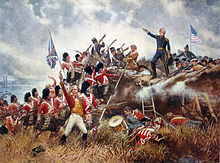 In the concurrent war against the British, Jackson's victory in 1815 at the Battle of New Orleans made him a national hero. 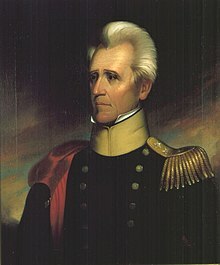 Jackson then led U.S. forces in the First Seminole War, which led to the annexation of Florida from Spain. Jackson briefly served as Florida's first territorial governor before returning to the Senate. He ran for president in 1824, winning a plurality of the popular and electoral vote. 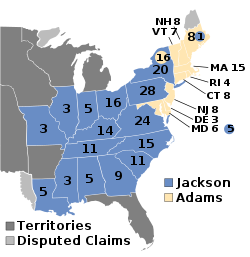 As no candidate won an electoral majority, the House of Representatives elected John Quincy Adams in a contingent election. 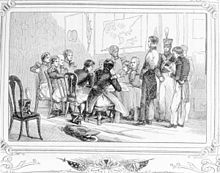 In reaction to the alleged " corrupt bargain" between Adams and Henry Clay and the ambitious agenda of President Adams, Jackson's supporters founded the Democratic Party. Jackson ran again in 1828, defeating Adams in a landslide. 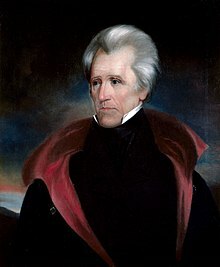 Jackson faced the threat of secession by South Carolina over what opponents called the " Tariff of Abominations." 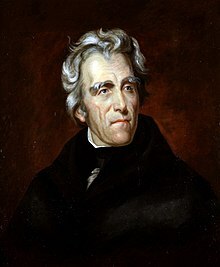 The crisis was defused when the tariff was amended, and Jackson threatened the use of military force if South Carolina attempted to secede. 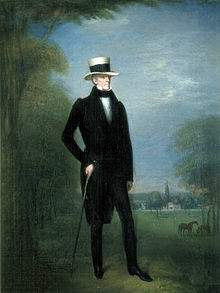 In Congress, Henry Clay led the effort to reauthorize the Second Bank of the United States. 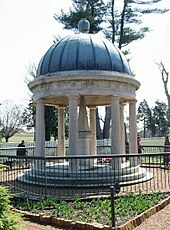 Jackson, regarding the Bank as a corrupt institution, vetoed the renewal of its charter. After a lengthy struggle, Jackson and his allies thoroughly dismantled the Bank. 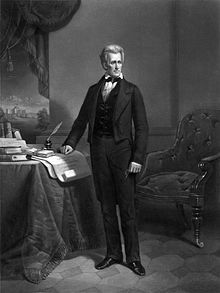 In 1835, Jackson became the only president to completely pay off the national debt, fulfilling a longtime goal. His presidency marked the beginning of the ascendancy of the party " spoils system" in American politics. 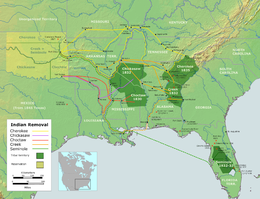 In 1830, Jackson signed the Indian Removal Act, which forcibly relocated most members of the Native American tribes in the South to Indian Territory. The relocation process dispossessed the Indians and resulted in widespread death and disease. Jackson opposed the abolitionist movement, which grew stronger in his second term. 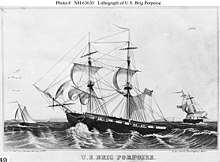 In foreign affairs, Jackson's administration concluded a "most favored nation" treaty with Great Britain, settled claims of damages against France from the Napoleonic Wars, and recognized the Republic of Texas. 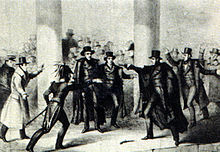 In January 1835, he survived the first assassination attempt on a sitting president. Berutti, Ronald A. (1992). "The Cherokee Cases: The Fight to Save the Supreme Court and the Cherokee Indians". American Indian Law Review. 17 (1): 291–308. doi: 10.2307/20068726. JSTOR 20068726. Cheathem, Mark R. (April 1, 2011). 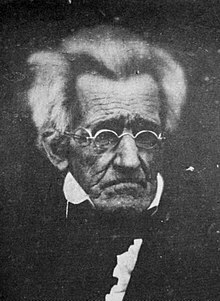 "Andrew Jackson, Slavery, and Historians". History Compass. 9 (4): 326–338. doi: 10.1111/j.1478-0542.2011.00763.x. ISSN 1478-0542. Prucha, Francis Paul (1969). 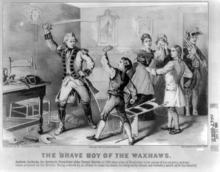 "Andrew Jackson's Indian policy: a reassessment". Journal of American History. 56 (3): 527–539. doi: 10.2307/1904204. JSTOR 1904204. Sellers, Charles Grier Jr. (1958). "Andrew Jackson versus the Historians". Mississippi Valley Historical Review. 44 (4): 615. doi: 10.2307/1886599. JSTOR 1886599. Jackson, Andrew (1926–1935). Bassett, John Spencer; Jameson, J. Franklin (eds.). 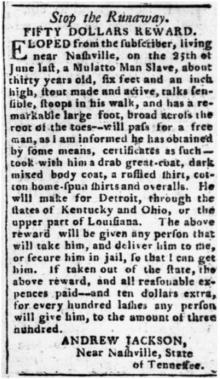 The Correspondence of Andrew Jackson. 5. Washington, D.C.: Carnegie Institute of Washington. OCLC 970877018. CS1 maint: Date format ( link) 7 volumes total.